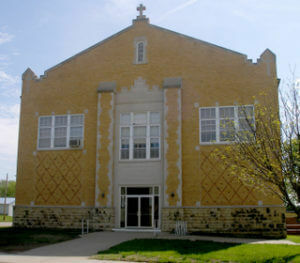 St. John’s Catholic School of Hanover, Kansas has the distinction of being the second parochial school opened within the limits of the present diocese of Salina. 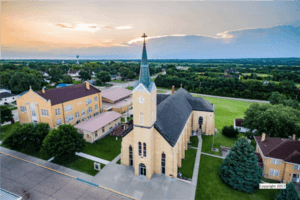 Father John H. Pichler believed that the greatest asset to any Catholic congregation was a Catholic school. When he took charge in 1876, he established a Catholic school. This was just six years after the first church was built. The first school, conducted by Sister Adelaide Cass, a Benedictine from Atchison, Kansas, was held in the Sister’s home on the present church grounds. The school was conducted in one room of the house. In 1882-1883, a separate school building was built of stone at a cost of eight thousand dollars. Classes started in the new building on September 3, 1883 with an enrollment of nearly one hundred pupils. By 1889, four Benedictines were in charge of the school with an attendance of one hundred twenty students. Hanover was one of the largest parishes west of the Mississippi. This school, with various improvements added, served until 1931 when the present building was built by Rt. Rev. Monsignor William Schellberg. The history of Hanover states “the crowning achievement” of Monsignor Schellberg’s pastorate was the completion of the present modern school building. In 1947, several social rooms were added in the school basement. In 1967, the present school was renovated and enlarged to include four more classrooms, a gym, showers and lockers, and a kitchen area at a cost of one hundred seventy five thousand dollars. At present, the school has a central library and audio visual room, principal’s and secretary’s office, and a faculty lounge. The enrollment of St. John’s has fluctuated from one hundred to one hundred fifty seven students. The largest enrollment of one hundred fifty seven is recorded in 1965. The same year, Mr. Richard Mueting was the first lay teacher ever hired by the parish. He was responsible for the first sport program for the school. The school has been accredited with the Kansas State Department of Education since 1956. In 1955, the children of St. John’s were permitted to participate in the Hanover Public School Hot Lunch Program, and since 1955 have shared bus transportation with the public school. St. John’s School organized a Home and School Association to assist the school in April 1961. Dr. Leo Bongers was the first President. In 1968, St. John’s School established a Board of Education with Mr. Bill Meier as the first President. One of the most outstanding features of the school today is the complete support and loyalty of all the parishioners.